Did not really think of a fancy name. 'Lian' just come to my lazy mind, simply part of the name of the case manufacture. The name is simple, clean and unique, which is what I am going for the build. The main aim for the build is pure silence. The fans only spin at 400rpm when system idle and only 600rpm during gaming load. The D5 pump spins at 2000rpm (out of 4800rpm) and is virtually inaudible. I am willing to sacrificed cooling for silent gaming. I had no budget for the aesthetics department. Wanted it to look good for my new house when I move in. But the build is purposed for 1440p gaming primarily, so did not spend way over the top for Titan XP and Broardwell-E etc. I'm from the UK, and PC parts pricing fluctuates a lot, plus our 20% tax on everything we buy :(. I bought everything before Brexit, at pretty much its lowest price point. Total ~£1950 (~$2300 exchanged at the time). CPU: i7 6700K: Quite self explanatory, there is only 2 options for unlocked CPUs on the Z170 platform, and I chose the more powerful one. Motherboard: Asus MAXIMUS VIII GENE: Had this from my previous build, at the time is was the best mATX option available, now arguably super-seeded by the ASRock Z170M OC Formula. I like the Asus's grey/chrome/black (and very little red) colour theme, and built my whole computer around this colour theme. RAM: 4x8GB Corsair DDDR4 LPX: Already had 4 sticks of DDR4 from my X99 build, and thought I may as well use them. Also wanted to fill up all 4 DIMM slots for aesthetics. 32Gb is obviously not needed but RAM was so cheap at the time of purchasing (Q2 2016). SSD: Samsung 850 EVO 500GB: At the moment I don't have the need for PCI-E NVME SSDs, SATA is enough for now. I don't need mass storage as I have as 9TB FreeNAS server in another room. 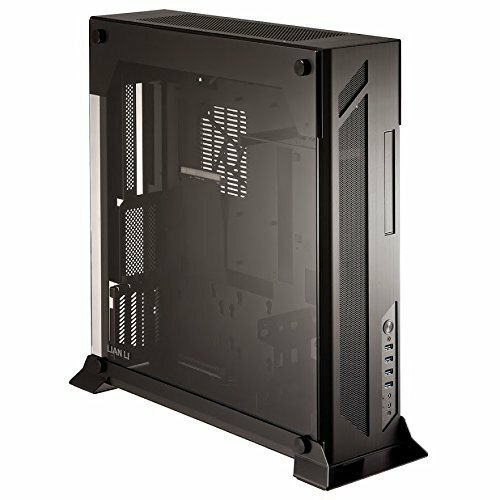 Case: Lian Li PC-O6SX: It's a niche case, expensive and underwhelming cooling performance. But it is stunning and a real statement. I put a lot of effort in aesthetics, wanting the build to look clean and unique. The case will be wall mounted when I move into new house. PSU: Seasonic 760 Platinum: Far from the cheapest around, but no coil whine, fan never spins up with the load I need. Good quality Tier 1 PSU. Holes drilled for pass-through tubing: Wanted a super clean look. Rather than having hard tubes and bends taking valuable space in the front area, I had the tubes all feed into the back usually used to stuff cables. The most difficult (and scary) part was measuring to get the holes aligned with the water blocks to give straight parallel tube runs. Stealth Reservoir: Again my secret is looking clean. Had the in/outlets run straight to the back. It appears the reservoir is floating in the air, quite happy of the way it tuned out. Some eagle eyed viewer may see that I screwed one hole when drilling, luckily I am an evil genius and did it from the back, so no ugly scratches can be seen from the front. Custom Dark Grey Pastel Coolant: Judging from the comments, people are liking my unusual choice of grey. I've actually trialled clear, red, white, grey and dark grey. http://imgur.com/a/XzdDF. In the end dark grey was decided upon. NZXT Hue+ Lighting: RGB is only for show. Most of the time it is OFF or white LEDs on certain areas only. The NZXT Hue+ is awesome for controlling what area to light up. Custom pattern Teleios sleeved PSU Cables: The pattern again reflects the motherboard design. These are great, very stiff, but when train they are going nowhere. For the ultimate clean look, I put the cable combs on the back so they are not visible. The combs are the sealed type and are great because they do not stretch out the gap between cables. Being Teleios (plastic) they reflect lights giving it a shinny look. I love them. Well, I am personally very happy with the build, I built is as a centre piece for my office/bedroom within to be new house. I feel I achieved this. It is a fairly unique build, designed and executed by myself and am pretty proud of it. I am very sensitive with noise, and very rarely used the word 'silence' to describe a computer. Unfortunately this does not make it into my 'silent' category. Of course, it is extremely quiet, and can not be heard more than 1 metres away. In fact, nearly the most quiet I have ever built over the 15 years. I probably am being very picky here but some people use the word silent more easily than others. Note: This is an revised description. Judging from the comments, I have been receiving great response from the PCPP community. Reached +90 within 24 hours without being a feature build and I am very happy about that. I would like to thank every one that has taken time to comment and upvote. It feels very nice when my hours of effort are appreciated. +1 for everyone! Thanks bud, grey is not very common, wanted to try something different. The motherboard has the monochrome colour theme, luckily grey fluid blends in very nicely. The visible fluid in the GPU block also spreads out the grey colour so it is more balanced around the case. Reminds me of a lot of thermal paste. Gives it an oddly satisfying appearance. lol, did not think of that, just so true! I have to completely agree. The grey pastel is just amazing. I have an AIO from swiftech and eventually will be replacing it with a pastel color ... maybe I will reconsider grey after seeing how nice it looks against the black background of your case. Thanks, glad people are taken kindly with my choice of grey. Yeah, i'd admit kinda expensive. I am kind of paying the price for a niche case. But having something a very different to the standard ATX layout is great fun for experienced builders. 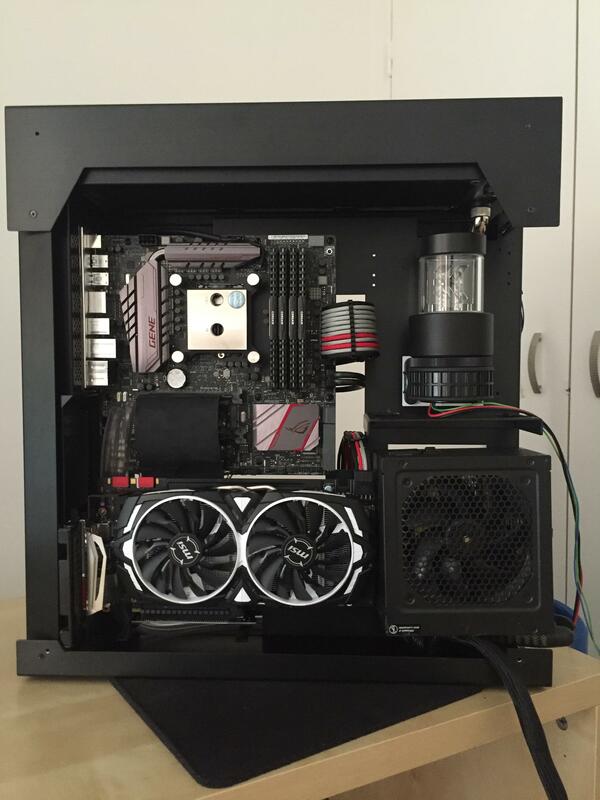 The case can only fit a slim rad, the temperatures are not bad considering the fan/pump speed. it can fit a thicker rad but would have to remove he fan filter. Very nice build. The custom water-cooling and mods looks amazing. +1 Wouldn't be surprised if this gets featured. This is absolutely fantastic, you deserve a feature for all of the work you put into this build! I have no words other than praise, +1 from me brother! Is there a way to see previous feature builds? You can. Just go to the completed builds tab at the top and on the left side should be an option for featured builds. Is there only one feature build at one given time? Sorry for noob questions, did not realise how popular this site is. This is one of the cleanest builds I've ever seen. Your hard work payed off big time. Enjoy! I'm trying to enjoy it as my daily driver, but when ever I use it to play games or do work, I end up staring at the case. Very distracting! I have only seen a few myself. And most of them were theme build done my professional case modders. Astonishing build. Yet i wonder if there would be any way to make this PCIe bridge look somewhat better. True, I can buy the revised ribbon cable, PW-PCIE30-1 for $75 (! ), but looks harder to manage. When it was new it looks very nice, but now it is a bit worn. By worn, I mean that the the glue on the shielding has become less adhesive, so there is some air bubble effects. Paint might cover up the worn look, that's what i was thinking. ic, it's actually made of some sort of fabric material, no idea what it is called. Pretty sure it can't be painted easily. I think this build will get a feature! Might need a bit bigger description (not your life story mind you). But I LOVE the quality pictures and great modding! The only thing out of place (or at least I think is out of place) is the PCIE cable from the motherboard...I know you have to have it there, but still...great build! The PCI-E extensions, does have it's benefits, covers a lot of rear cable management. Exquisite. Can I hang it on my wall? Well done. Direct short tubing and so clean. I could watch it all night like if it was an aquarium. All things considering the cost isn't that bad. Even better. No matter the cost this to me is the epitome of a clean simple aesthetic. This is impressive. Awesome job! Very well done and unique build. I love seeing different cases and how people put them together. +1 for you. I decided to pick my favorite of the most recent 5 builds and yours is it, good job man, here's a gold sticker. np bro! (decides not to tell him the rest were complete trash) Just kidding it actually looks sick! To be fair the others published around the same time as mine were new builders, have budgets or purpose built stuff. Mine is a purpose built showpiece project (as well as being my daily driver). I am no pro case modder, but have been building PCs for 15+ years since I was 15 year old. wow thats cool, im 16 and all i can do is cut a piece of metal out for cable rounting with these giant scissor lookn things that are made for cutting metal. wait i actually have song that describes this build perfectly, https://youtube.com/watch?v=seKaCr7yTeo. This is beautiful. Thanks for sharing all these great pics! 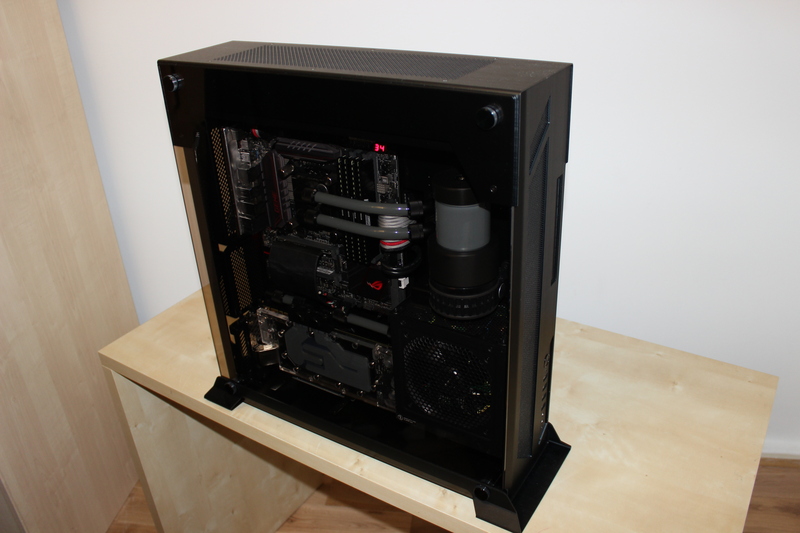 What goes into designing the custom watercooling with your case? Where do you start? I wanted a clean look, parallel tubes, so it does not fight attention with the main components. Rather than have hard tube bends taking up the limited space, I decided to have the tubing run straight through the back, so it is not seen. And all the ugly bends are at the back. To do that I needed to lower the PSU from the manufactured intended position, so the CPU tubes have somewhere to go. I also the flip the CPU 90 degrees (goofy mount) for aesthetics reasons. The GPU pass-through I am very satisfied with, just unfortunate the PCI-E cable is covering one of the fittings (right side), making it look less clean. It's nice to see some cables so we know you're human :) It's easy to tell this is a very well-planned and careful build. Thanks for sharing! I think I did OK in terms of routing the extra length etc, but those chunky cable clips are ugly. Ok is an understatement, this took a lot of time and determination. Thanks, I've seen loads of builds with bright primary colours, I wanted a more neutral colour. Dark grey is perfect fit with the motherboard, there is shades of grey everywhere, so does blend in nicely. Almost leaned towards clear coolant, as that too look classy. Great looking build. Super clean with a lot of attention to detail. It's already been said, but you deserve a feature for this. Regardless if it get featured or not, what matter to me is that people take time to comment and up vote. F'in SICK! 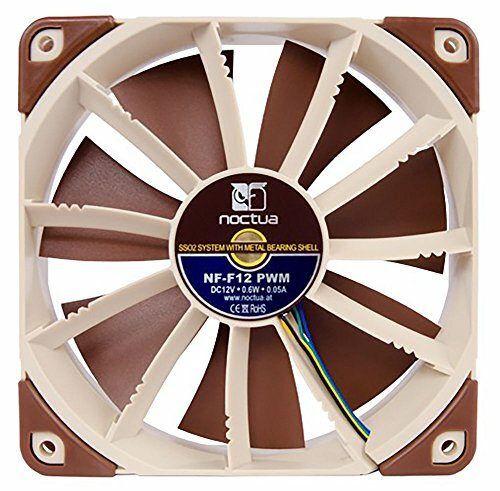 I was wondering where the infamously poop-colored Noctua's were and they're perfectly hidden away! Amazing Build! gray liquid? Unusual choice but at the same time it's fantastic looking with the rainbow theme of the leds... Everithing inside a lian-li pc.... Amazing job!!! Dude, this build is legendary. Having a slim water cooled case is nothing I've seen before, as well as the liquid being grey. +1 for originality! Thanks man, dunno about legendary but it is kinda different. The case is not all that thin (about 15cm). But its that the components that are right close to the glass side panel, giving the illusion that it is a thin case. We are just used to seeing big cases with loads of room. I'm happy the way it turned out as the space is filled without looking to cluttered. Thanks, very happy people are taken kindly with it. What is the right angle power cable that you used for your PSU? It's just a standard c13 right-angle plug. Bought it on eBay, it is open ended, so I can cut the cable to length. Can you link me the pieces that were used for the two runs from the CPU block? The metal-like gaskets that you used to have that sealed look as the tubes go through the case. They are called pass-though fittings. https://www.ekwb.com/shop/fittings/extra/pass-through-panel-mount . Mine are EK ones but most big name brands do them. In case you did not noticed, I also used them for the two GPU runs. Thanks for all your help so far. What were the fittings you used coming from radiator and going through the small gap at the top? I can't quite make them out from your picture. They are single rotary fittings, so I can freely turn them to the exact angles I want them. Did you follow a tutorial for the holes you drilled? And which kind of fittings did ou use to seal the holes? Great buil, +1 from me! no tutorial needed, it's pretty straight forward. How much was the build in total? Thanks bud but really? I thought I might get slaughtered for picking an expensive niche case :D. But did work out aesthetically pleasing in my eyes. It's not really a competition but it is a good way to suss that I am going in the right direction, and that I do not have bad taste in looks.